It may not feel like Spring quite yet, but it’s time to dress the part. Incorporating florals, stripes and flowing fabrics into our wardrobe will get us in the mood for Spring/Summer. This season is all about bold prints, texture and colour. With that being said, when choosing which pieces to rock this SS, it is important to remember who you are, what you’re most comfortable in and bringing these trends into YOUR own style. We often lose ourselves with what is trending or how other people are putting themselves together. It’s time to step back and remember what YOU love, what looks best on YOUR figure, with YOUR skin tone etc. not what works on the next person. Style is about you, and that’s what is so cool about it - the uniqueness of how you put things together and confidence one exudes while feeling great is something no one else has. As many of you know, I typically don’t dress or do my hair/makeup or home decor based off of what is “trending”, but rather what makes me happy and feel like myself. You can change the style you are putting together by simply changing the shoes, accessories or your hairstyle. These elements are what makes us unique and us girls need to find the inner confidence to embrace our personal style. After all, there are no rules in fashion anymore! My wardrobe for spring 18 is all about mixing masculine and femininity together. My typical go - to is clean lines, dark colours and a lot of textures, however, I also love the contrary - sheer, texture and softness. I have combined these elements together to create this look. The moody floral print brings a bold statement while the lace up detail and silhouette are more feminine. The soft satin fabric on the bomber creates an interesting dimension to the look. To finish it off, I paired it with the cutest strappy heeled sandals with the pearl and pyramid studded details. Obviously I feel comfortable in this look because it’s predominantly black [haha], but it’s all about how each piece says something about you, and once you put them together it feels authentic, comfortable, and most importantly you ooze confidence. 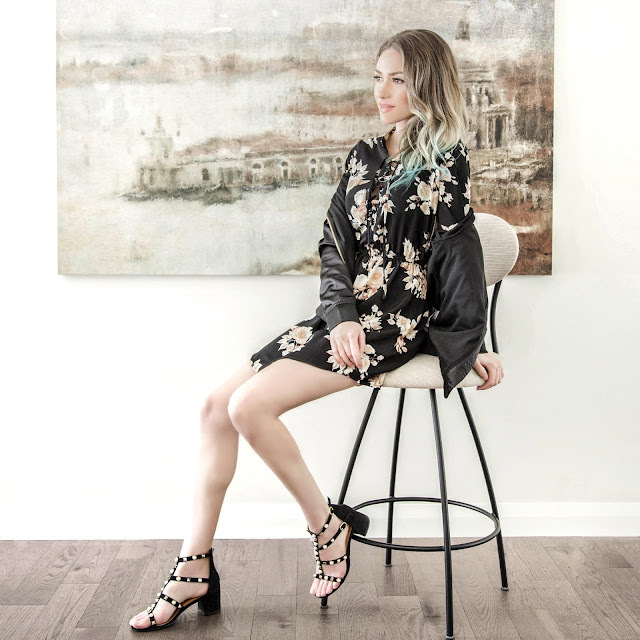 Click here to check out more of Ardene’s Spring collection and find the pieces that speak to your style. We have partnered with Ardene to give you guys 15% off sitewide with code: ELENA15 - Happy Shopping! Some great spring style tips, i've sent this post to my lady! Great read! Thanks for sharing this blogpost �� Really enjoying the images! Awesome write up! Thanks for sharing!